Recently I finished playing two blockbuster video games, Assassin's Creed III and Skyrim, but I didn't actually complete them. Since these are modern AAA games, they were filled with excessive amounts of extra, often pointless, content, but I'm not referring to those parts of these games. I never reached the end of these games, did not see the end credits roll, and I don't have an immense desire to finish them. I was tired of fighting monsters, both literal and metaphorical, and had discovered a lot more about my own personality in the process. 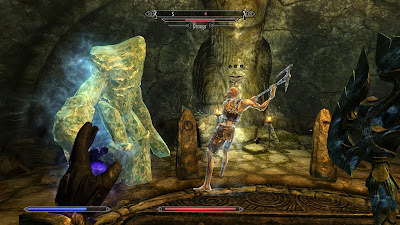 In Skyrim, you play as an adventurer of self-determined origins who discovers he/she is Dragonborn, a unique form of warrior able to slay and absorb the souls of dragons. The main plot is rather thin, as it can essentially be summed up as kill dragons, find out who is bring back the dragons, and eliminate them as well. It's mostly an excuse to explore and interact with a huge fantasy world, buildling your own story along the way. Exploring dark tombs and ancient ruins, my created character faced undead abominations, malfunctioning mechanical wonders, and a virtual legion of bandits and thieves of various sorts. It was interesting at first, but soon I found myself bored with bashing zombies with a large, blunt weapon. I focused on the game's minor content, building up a home of my own, adopting an orphan, then finally marrying a fellow adventurer. Instead of stealing from untouched ruins or disturbing otherwise isolated creatures, I was creating a better life for my character. Standing in front of my newly completed house for my virtual family, I suddenly felt that my character's story was complete. He had made a home and family in a harsh world, and it seemed like the greater threats were better left to a different "chosen one." 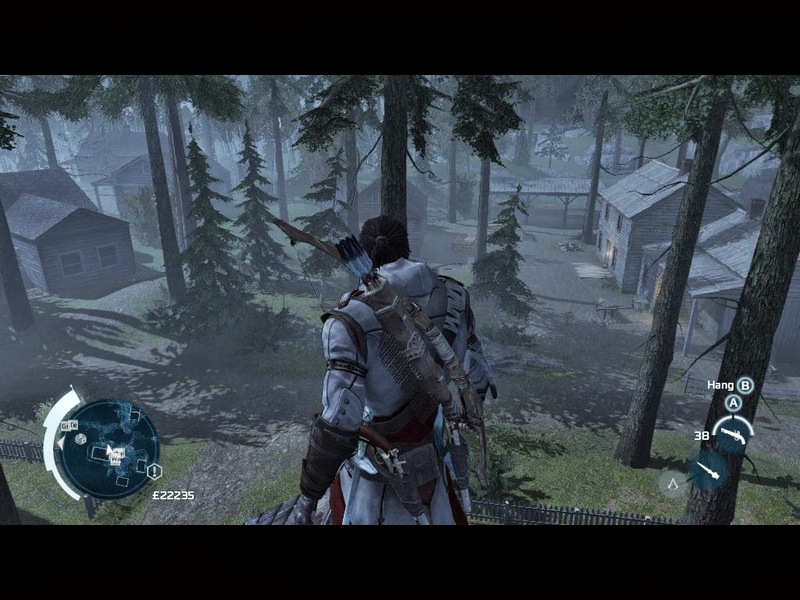 Assassin's Creed III has you fighting metaphorical monsters, ambitious men with a terrifying vision of morality. Ostensibly, you're supposed to act as an assassin to stop your foe's plans and their interference with the birth of the United States. However, assassin in this game's definition includes committing a large amount of collateral violence in the process, leaving you as more of a morally ambiguous murder than those you're supposed to be stopping. The game addresses these concerns to a point, but this doesn't make the process any less unsettling. I again found myself enjoying the extraneous gameplay far more than the killing and destruction. There's an entire part of the game world devoted to building a wilderness homestead, rescuing wayward souls from their debts and their pasts. Step by step you build up a small community devoted to helping each other prosper. I quickly realized that I was completing the main portions of the game not to see the cliched story trudge along, but rather to unlock more opportunities to build that homestead. I didn't feel heroic eliminating the supposed foes of free will for nebulous reasons. I felt heroic when I raced across the wilderness to help deliver a baby, or when I led a group of allies to fight off the abusive husband of a defiant seamstress. Eventually, I realized that I had completed almost all of the homestead, and further advancement of the storyline would not unlock much more. The next time I became annoyed at the gameplay and the storyline, I just stopped playing. My character had built a strong community out of an uninhabited bit of wilderness. I felt that was a better accomplishment to mark the end of his story, not the fulfillment of some bloody tragedy. I'm quickly realizing that as I get older, I enjoy random destruction and overblown attempts at serious plotlines less and less. Stories about being a hero by committing mass slaughter no longer hold my attention, and attempts at darker stories with amoral antiheroes feel increasingly repellant. If a game has a story, I want it to be something interesting and well developed, unconcerned with emulating Hollywood blockbusters. Like Gone Home, Kentucky Route Zero is a game that uses simple game mechanics to tell a compelling story. It's concerned with creating a complete experience that doesn't feel obligated to include tedious puzzles or unnecessary challenges, and only takes a few hours to complete so far. 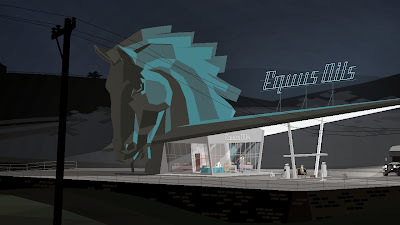 Unlike Gone Home, the game presents a surrealistic story set in a magical realist Kentucky. Lost trying to deliver antiques to an address that might not exist, your character travels an abstract vision of the South filled with damaged people and the ghostly past. The vector graphics create beautiful scenes that look like paintings, while occasional bluegrass songs float into the soundscape during key moments. You meet a wide array of lost souls, and your responses to them build your own vision of your character's place in the world. The game is being released in installments, and so far the mysteries of the story have only increased. However, what is available so far feels like a Southern Gothic poem transformed into a explorable world. That's a lot more interesting than another tale of revenge or violent heroism. Maybe that's the key, in the end. Most blockbuster video games still focus on adolescent fantasies and stories that are just excuses for those fantasies. As I grow older and see the strife and discord of the real world, I find the virtual violence less heroic, and want something more mature. I want to explore worlds that aren't just fantasy cliches, experiment and create in virtual spaces, and learn more about myself and my world through new forms of art. I don't want to play in worlds created just for me to destroy them. I don't want to fight those monsters, because they're probably not that different from me anyway.